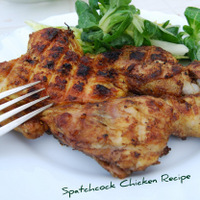 Spatchcock chicken is a great way to cook a whole bird quickly. We use individual portion sized chickens that we buy here in Spain - Picatones in Spanish, Poussins in French - but it works well with any bird you want to cook evenly and quickly. Just cut down either side of the backbone with a good pair of kitchen scissors and flatten out the bird on a chopping board, we cut half way through the leg joint and make a couple of slashes in the legs to help them to cook at the same rate as the breasts. 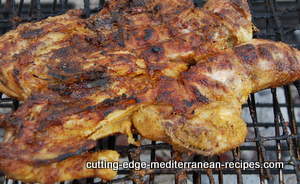 Rub the whole bird with our mediterranean spice mixture and leave to marinate for a couple of hours. 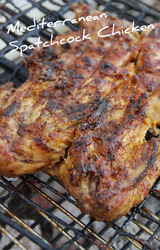 You can do these on a barbecue grill or in the oven if you prefer. Serve with a crisp green salad and a crunchy baked potato. Two Picatones - Poussins of about 450g./1lb. or one small chicken of about 1 Kilo/2.2lbs. 1 Piece of star anise. 2 Dried chillis - guindillas. 2tsps. Spanish smoked paprika - Pimenton. Right - first make your spice mix. Dry roast the coriander, cumin, peppercorns, star anis and chillis in a pan. Add the salt, pimenton and garlic powder, stir and remove from the heat. Whiz the whole lot up in a spice grinder - we use a small coffee grinder. Now rub the mixture into the bird or birds and leave to marinate for a couple of hours. Meanwhile rev up your barbecue or pre-heat your oven to 180ºc/360ºf. Cook gently over the coals until perfect - or about 45minutes to one hour in the oven. That's it - serve with the lemon cut in two.